This clip, from "Unconditional Surrender" - a film about polio and its first preventive vaccine by Dr. Jonas Edward Salk and his colleagues - takes us behind the scenes in the 1950s when polio was quickly and consistently spreading among children throughout America. In 1952, for example, an outbreak of polio caused many people to be placed in iron lungs. This image, online via the National Museum of American History (courtesy Rancho Los Amigos Medical Center in Downey, California) depicts multiple iron-lung patients being cared-for by nurses that year. Some individuals with polio had to live in iron lungs for decades (for the rest of their lives). That's because the polio virus significantly harmed their respiratory muscles, rendering them unable to breathe on their own. Montgomery, Ala., July 10 (AP) – Medical authorities today pronounced the first mass gamma globulin inoculation a success in reducing polio. The serum was injected last week in more than 31,000 Montgomery children in efforts to halt a near epidemic. Two cases were reported here yesterday and another today, bringing the county’s total to 91. “The mass immunization program of children 9 years old and under in Montgomery county – the first test in the United States – has proven to be effective in reducing the number and severity of polio cases. On the 26th of February, 1954, Dr. Salk and other health-care providers began the first mass-testing of the vaccine in Pittsburgh. 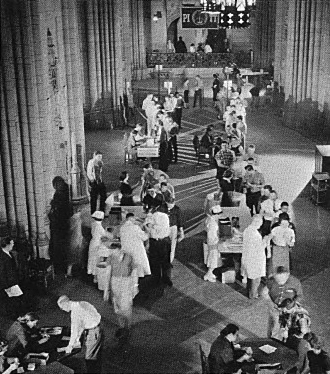 Children lined-up in the Commons Room of the Cathedral of Learning, at the University of Pittsburgh - the place where Dr. Salk and his team created the vaccine - to be innoculated. Both vaccines are still used throughout the world to prevent children and adults from contracting the disease which can be both paralyzing and deadly. When the vaccine is not provided to children, however, the polio virus reemerges, then spreads. A case-in-point occurred in Pakistan where the Taliban outlawed polio-vaccination programs for about two years. Not only did Pakistani children become ill with polio, the virus—known as "wild type 1 poliovirus" (WPV1)—spread. It reached Syria in 2013. Dr. Salk, who was born on 28 October 1914, died on 23 June 1995. Bos, Carole "Preventing Polio with Salk's Vaccine" AwesomeStories.com. Dec 25, 2013. Apr 21, 2019.